Easy way to make shrimp kabobs on the bbq grill. Barbeque shrimp tastes great. It's easy to cook. For this operation we are going to want to have intense heat for a period of 7-15 minutes. 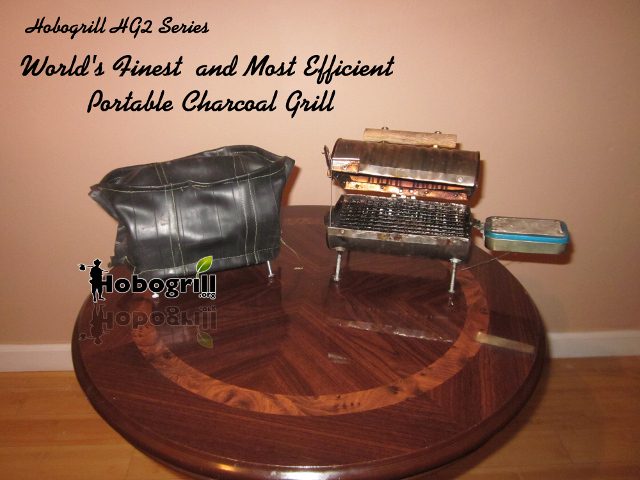 The coals should be such that to produce intense heat either fresh charcoal with small uniform pieces. Saturate individual coals thoroughly with fluid from the lighter tin. Wait 1 to 2 minutes, then re-saturate and light. How hot the coals get depends on the many factors such as available oxygen which can be relatively low in the mountain tops with no wind and relatively high by the sea with high winds. Place salmon on the Hobogrill skin side down. Carefully sprinkle the garlic powder, onion powder and pepper on the raw salmon while it's on the grill. Close the lid for 4-10 minutes checking periodically to ensure the fish is thoroughly cooked. Note: The white stuff that sometimes comes out of salmon when you cook it is called albumen. A quick and simple garnish is some dark green edibles such as cilantro, parsley, chopped green onion, or chives. Paparika for color and a lemon wedge. It's alright to experiment with the order of which you put these things on.